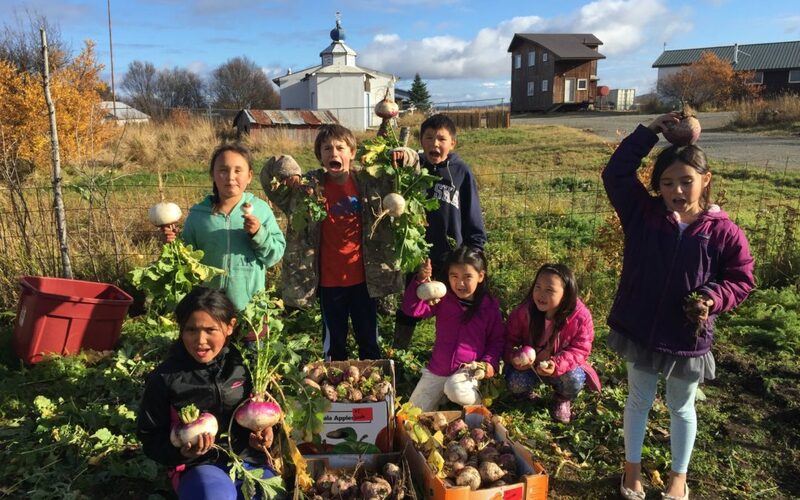 A year ago, about one-third of the residents in a small, rural Alaska community decided to take on a challenge — to eat only traditional, local foods for six weeks. What would happen if the community ate only traditional, local foods for six weeks? ​How would their health be affected? Would they notice changes in blood pressure, blood sugar or body weight? What started out as a children’s challenge resulted in noticeable improved physical health for the small village’s adults, Gooden said. Igiugig — southwest of Anchorage on the Alaska Peninsula — has only 69 residents. Twenty participants, ranging in age from 7 to 48, completed the challenge from Sept. 13 through Oct. 30, 2017. “We had a lot of weight loss in the adults, which was great,” Gooden said. Nine adults lost a total of 192 pounds during the six weeks, he said. One adult who had diabetes reported being able to cut back on medication during the challenge. Another adult reported a decrease in high blood pressure, he said. Gooden’s students wrote a report about the steps of their challenge from start to finish, they summarized their findings and then presented the project at the end of last school year during a science fair. It all started by reading a book for class. Two years ago, Gooden’s high school students read “In Defense of Food,” by Michael Pollan. This book discusses an experiment in Australia when Aboriginal people traveled into their traditional rural homeland for seven weeks and ate only foods they could hunt or gather. Then they examined the health outcomes from such a diet. After reading the book, Gooden’s class in the Lake and Peninsula School District wanted to try something similar in rural Alaska. The students pitched the idea to the community and learned that many residents wanted to join in on the challenge. It started with baseline health screenings in January 2017 at the community health center run through Southcentral Foundation. The community health aide measured participants’ blood pressure, blood sugar levels and weight. Those screenings continued monthly through the end of the Native Food Challenge. Then the community scheduled the challenge to start in September 2017. Planning in advance meant participants had months to harvest, prepare and store fish, berries and greens to eat later during the challenge. Each participant got to choose how strict they would be with their eating. Some called themselves “purists,” eating only foods found close to Igiugig. Another group only ate foods from Alaska. A third group focused only on whole foods, skipping packaged or processed foods. Igiugig has a store, but Gooden says the food there is often processed and costly. The fourth group of participants were less strict with their eating. All groups were allowed to add oats and salt to their diets. Gooden listed many examples of what counted as locally caught or grown food: salmon, moose, ducks and geese, chickens, wild greens and berries, and food that grew in the gardens, such as kale, turnips, tomatoes, potatoes and rutabagas. What they were eating became a daily conversation, he said: “What are you having for dinner? Do you have anything for me? Do you want to trade?” Participants got creative with their ingredients. Someone made rutabaga and potato chips by thinly slicing the vegetables, then salting and baking them, Gooden said. The group punctuated the food challenge with a 22-mile hike to Big Mountain, an area that is historically and culturally important to Igiugig residents, Gooden said. When they arrived, the participants had a potluck featuring native foods. It took multiple days to complete the hike, walking through windy, rainy and chilly weather. That hike stood out for the children. As the project ended, the students wrote conclusions in their report. There were parts of the challenge that were difficult. The students wrote that they learned a lot about food and their health. The community is planning to do another food challenge in the fall of 2019, Gooden said. The participants in 2017 valued the shared experience, he said. © 2019 Alaska Health Fair, Inc.. All Rights Reserved.